The science of engineering materials, at the molecular level, oftentimes leaves researchers scouring nanoscale structures for minute signs of scientific significance. But, from time to time, they take a moment to step back and give us a rare look at the small wonders they’re so closely observing. Scientific image competitions, like the National Science Foundation’s annual Visualization Challenge, present an opportunity for researchers to publicly reaffirm the link between scientific thought and creative expression. The image pictured here, entitled “The Cliff of the Two-Dimensional World,” illustrates a bit of materials science being pioneered at Drexel. Ultrathin layers exfoliated from a titanium-based compound look a lot like something you’d find in Arches National Park. Their actual use in research is to produce materials that could eventually be used to make more efficient energy storage devices. While the research, from the Department of Materials Science and Engineering, has been steadily gaining repute in the field of materials science over the last few years, the image, by doctoral student Babak Anasori, drew attention as well when it earned the “People’s Choice Award” in the 2011 NSF Visualization Challenge. 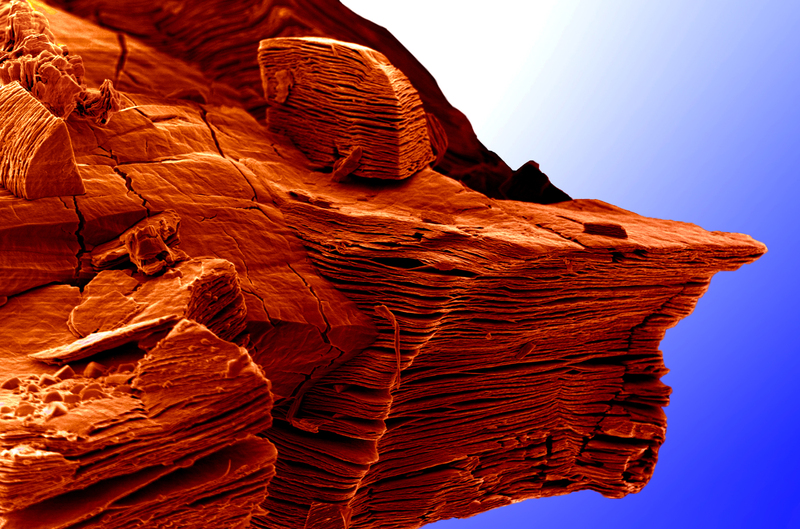 While few of us have had the chance to view these materials through an electron microscope, they might still look pretty familiar. The “nano goldfish” created and imaged by Anasori, doctoral student Michael Naugib and Drs. 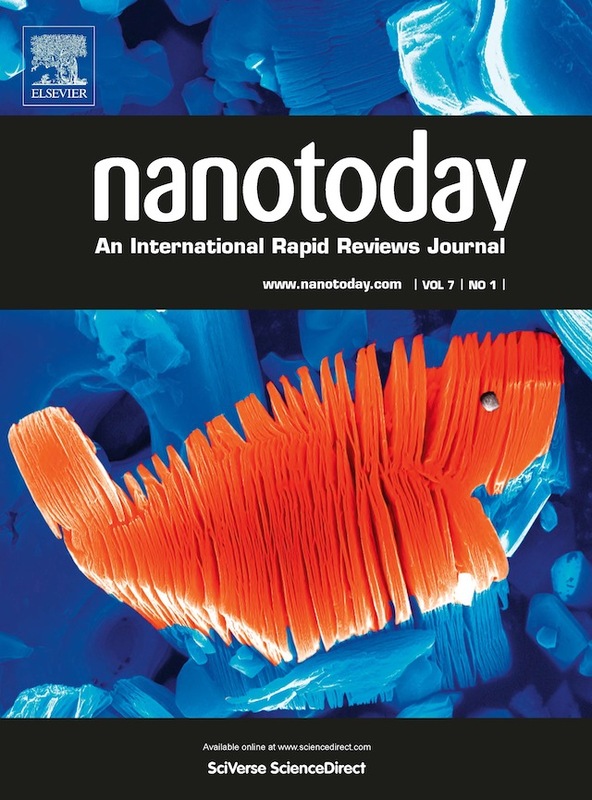 Yury Gogotsi and Michel Barsoum earned a place on the cover of Nano Today over the winter. More recently, an image from Dr. Craig Johnson, of Drexel’s Core Facilities, earned some acclaim from the company that produced the imaging technology with which it was captured. Johnson’s enhanced image of a decahedral gold nanoparticale won the materials science category of the 2013 Gatan Transmission Electron Microscope Image Competition. 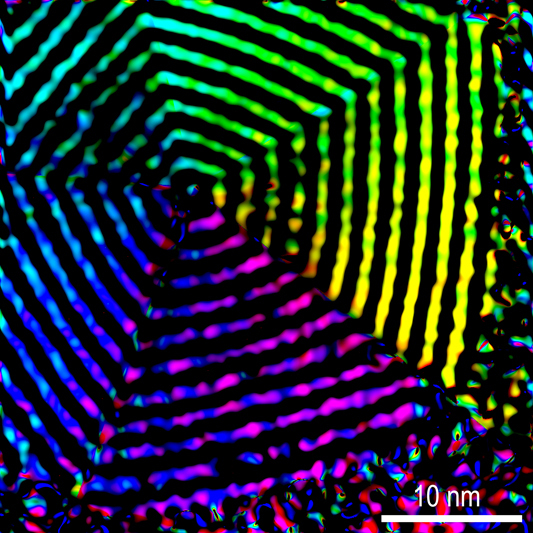 This colorful snowflake-like nanoparticle was originally imaged in 2008 using a transmission electron microscope produced by Gatan, Inc., one of the largest producers of instrumentation and software for enhancing electron microscopes. “The image illustrates the bending of atomic planes in a 10-sided nanoparticle of gold. The decahedral geometry of the nanoparticle requires that the planes be bent to maximize structural stability,” Johnson said. Prior to Johnson’s work, the internal structure of this nanoparticle had been observed only indirectly. Through a process called geometric phase analysis of transmission electron microscope images, Johnson was able to make the first direct measurement of the phenomenon. The colors were added to the image to delineate the degree of bending in the planes. The finding was also published in Nature Materials in 2008. If this piques your interest in the beauty of nanomaterials, you can visit the A.J. Drexel Nanotechnology Institute’s Image Library to view a selection of pictures that are stimulating – both mentally and visually.